Adult Carpet Beetles are not the real problem with this common type of pest as they tend to live outside. However, carpet beetle larvae have voracious appetites and capable of eating through carpets, clothing, furnishings and just about any natural material. Carpet beetles can be difficult to eliminate from your home. To help, we have combined some of the best products available and created ready to use kits, containing the necessary products to control bed bug infestations. There are several types of insecticide sprays and powders that are effective against carpet beetle larvae. 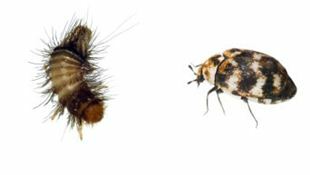 Carpet beetle larvae have voracious appetites and capable of eating through carpets, clothing, furnishings and just about any natural material. Insecticide sprays are one of the most effective forms of control against carpet beetle larvae. These sprays should be applied liberally on the underside of the carpet and around the edges. Carpet Beetle Killer Powders can be sprinkled and dusted into carpets, around the skirting boards and under furniture. Powders and dust can either be left in the carpet to provide continuous protection against carpet beetles, or hoovered up at each treatment. Some powders are free from insecticides, making them ideal for use in chemical sensitive areas, such as kitchens. Carpet beetle larvae are very difficult to spot. They can be living in the most hard to reach areas of your home. The use of Carpet Beetle Killing Fumers & Foggers is an ideal method for eliminating carpet beetle larvae in such areas. Simply set off in an enclosed room and the fumer or fogger will kill most of the carpet beetle larvae in the room. Pest Expert Formula 'P' Fumers are carpet beetle smoke bombs for fumigating carpet beetle infestations. They release a smoke which can penetrate into cracks and crevices to kill carpet beetles harbouring there. Two Twinpacks are required to treat a standard room. 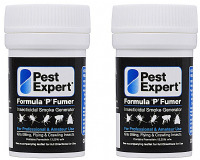 Pest Expert Formula 'P' Super Fumers are carpet beetle smoke bombs for fumigating carpet beetle infestations. The permethrin smoke penetrates into cracks and crevices to kill carpet beetles harbouring there. 1 Super Fumers is required to treat a standard room. The strongest amateur approved Carpet Beetle killer on the market. Lasts for up to 12 weeks after being applied. Professional Use Only. 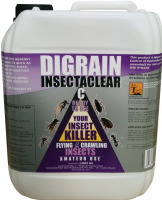 Dual action carpet beetle & insect killer combines instant killing with long lasting protection. A simple fogger device, once set off will kill all carpet beetles, including in hard to reach cracks & crevices. Protector C is an insecticidal surface and space spray, which kills carpet beetles & other crawling and flying insects.